Nothing is more calming than be friend with nature. No pollution, no noises, no pressures, just relax! They will probably say, “So which of the favors of your Lord would you deny?” Even though I am not a religious person, but I love to live in peace anyway. I really wanted to go outside! But not now, because I had to finish some of the assignments that I had not done yet. It was holiday though. I just wanted to get away from this stressful life. But I did not know how. My parents asked me out to go to Kuningan. Unfortunately, I still could not move on from my laptop. I borrowed my brother’s novels to kill the boredom for my interlude. They really helped me to overcome my boredom until I lost in time. I always forgot my lunch time, that was one of the cause my mother’s anger. Finally, we arrived at parking area of Lembah Cilengkrang. We needed to go to the counter first to buy tickets which were twenty thousand for two tickets. After that, we had to walk perhaps for half an hour, approximately one kilometer in distance. During the walk, I could see the beauty of nature, the blooming flowers which I rarely found in my environment, and I could hear the sound of nature such as the sound of cicadas. Because it was so beautiful, I did not forget to take photos of it. My brother told me to go ahead. Oh my God, you could not imagine how many stairs that I had to climb. I was getting exhausted but everything was paid off until we arrived. 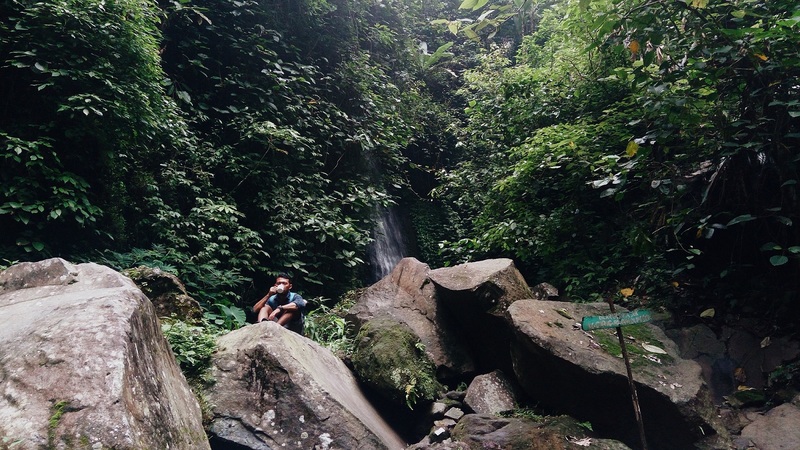 I would not lie, that was my first time going to curug as long as I could remember. I looked around and found several things that caught my attention; I took photos of a group of ants. There were some people taking selfies, and some who were playing around there. You know, there was something that I did not notice. My brother actually brought some of his outdoor stuff. Some of them were cooking tools, for example portable stove and a pan. He also brought some meals consisted of instant noodles, indomie, which I really liked, coffee, and Oreo. We decided to make a meal together. First of all, he tried to turn on the stove. Because it was different from general stoves, he had to put the gas can into the stove and light it up. While he was preparing the stove, he also asked me to prepare the rest, you know like indomie and stuff. Once it was ready, we cooked the noodles. I was snacking the Oreo when I saw some high school students played in the water. One of them approached my brother and asked him to take photos of them. He told me to watch if the noodles were done or not. I looked around and took photos instead of watching the noodles. Though I did not exactly watch it, but I successfully managed to not let the noodles overcooked. When it was done, we ate it but it was not enough. Hm.. Something was missing. Aha! The coffee! We had not made it yet. My brother asked me to wash the pan first. Then, we boiled the water for the coffee. Voila! The coffee was finally ready. Ahh.. There was nothing more relaxing than this. While we were drinking the coffee, my brother told me about his ex-girlfriend. I was not interested to pay attention. I would rather play Fana Merah Jambu than listen to his whining about her ex whom he had ever brought here. Was there anything interesting than listening to indie song in the middle of the serenity? One thing that I wanted to tell you was we were never been like this before. My brother would not care much as this about me if we were at home. In fact, he would make fun of me at home. That was my first time hanging out with him in nature spot. It was his passion to visit places like this. Nature was like his secondary home. Well, maybe his main home. That was why his hospitality came up more than usual. After spending our time hanging around Cilengkrang and the sky had gone dark, probably our parents had worried about us, because there were clearly no signal whatsoever, we decided to go back home. We cleaned up, because we cared about the environment, trashes around us. The most interesting part of our trip to Cilengkrang was when our way back home. I opened my camera and started to act like a photographer and vlogger. Suddenly, I came across something weird. Did you know marijuana leaves that Bob Marley used to smoke? Yeah! This leaves were exactly like what I thought. It was lying around the path we would walk on. My brother and I be like.. What the… Who dared to put that thing on there? We stepped a little closer to observe. I thought there were some people planting it over there. The closer we got, it was clear that it was not what we expected. It turned out to be just a wild plant, similar, but not marijuana. Thank God! We walked forward for another couple hundred meters. We met the one who was in charge for the cleaning duty of Lembah Cilengkrang. My brother stopped for a second and talked to him for a bit. From him, we knew that yesterday was so crowded there. So that was why there were quite a lot of trashes left behind. After a little chit-chat with him, we continued to the parking area where my brother left his bike. When we reached the area, we took a rest for a while and we met again with the high school students. I checked my phone and my guess was right. I got lots of notification from my mother. She was worried about me, like a lot. Could you imagine I got fifteen missed calls and God-only-knew how many chats she sent me? I was nineteen, I thought she should not be that panic. Besides, I was with my brother, her son though. I was really sure that he could protect me. I did not want to take any risks, so we just went straight home. Well, the sky had gone dark and cloudy anyway. It was so cold. We did not want to get stuck in the rain while we were on the road back home.